The California Exposition and State Fairgrounds, site of the California state fair since 1968, seems like a permanent fixture to many Sacramentans. Older generations still remember the old fairgrounds at Stockton and Broadway. But that site was not the original location of the fair either; it was chosen when Sacramento’s urban growth crowded the fairgrounds out of their first permanent home – in Midtown at 20th and H Streets. 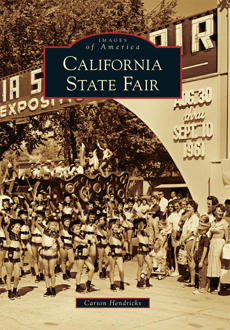 The very first California State Fair was held in 1854 in San Francisco. For its first few years the Fair moved around the state and was held on temporary fairgrounds. 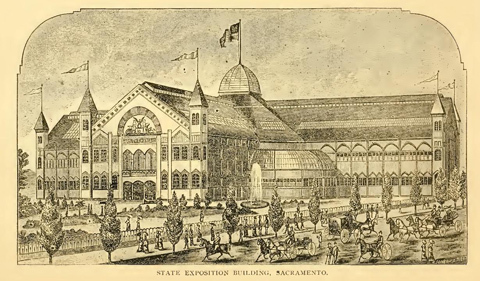 In 1861, the State Agricultural Society made Sacramento the permanent home of the State Fair, and obtained a plot of land between E, H, 20th and 22nd Streets to use for livestock exhibits. This plot was expanded to provide room for a racetrack, known as Union Park, and later expanded again to stretch north to B Street, covering 30 acres. Starting in 1870, a horse-drawn streetcar line, owned by Agricultural Society president R. S. Carey, carried visitors from the Central Pacific passenger depot downtown to the fairgrounds along H Street. Another streetcar line carried visitors to the Grand Pavilion of the State Fair at 6th and M Street. A larger pavilion was built at 15th and M in 1884, the current site of the Capitol Park rose garden. Races and livestock events took place at Union Park, county exhibits at the Grand Pavilion. However, by 1900, the route of the streetcar line (now electrified rather than horse-drawn) to Union Park was a high-priced residential neighborhood, almost completely built out. Boxed in by two rivers and two levees, Sacramento’s room to grow was limited and high prices in the city spurred the growth of suburbs like Oak Park and Highland Park. Meanwhile, California’s growing population meant the State Fair was becoming crowded. The State Agricultural Society had advocated for larger facilities since the late 1890s. Meanwhile, Sacramento’s business community hoped to emulate the explosive suburban growth of Los Angeles and the Bay Area. A new fairgrounds outside of town meant room for Sacramento to grow, and an opportunity to create a modern fairground to showcase California to the world—and Sacramento to the rest of the state. The old Union Park’s desirable location close to Downtown made it a profitable opportunity for Sacramento real estate developers. The Park Realty Company, presided by Clinton L. White, bought the fairgrounds in 1905 and christened the new neighborhood Boulevard Park. City engineer William Mullenney designed the new neighborhood using the latest principles of “City Beautiful” design: street trees, landscaped medians, paved sidewalks and streets, modern plumbing and sewers. The south end closest to the streetcar line had the largest, most expensive lots. Deed covenants prohibited business uses, front fences or barns, and mandated large, expensive houses. The south end also included private parks located in the center of each block. Clinton L. White built his own home on one of the prime corners of the new neighborhood in 1908, the same year that he became mayor of Sacramento. On the north end, near the Southern Pacific main line, lots were smaller and less expensive, but still featured landscaped and paved streets. While too costly for the very poor, they were affordable to clerks, railroad employees, craftsmen and small business owners. City Beautiful design principles encouraged home ownership for working people, in the hope that more pleasant cities would make them better citizens. One block, between 21st, 22nd, B and C, was originally platted for homes until Park Realty encountered a problem. Originally designated as a city park block by John Sutter Jr., the lot was sold to a private party by Sam Brannan, but Brannan never paid Sutter for the land. Decades of court battles over the land title were ignored while the racetrack was on the lot, but legally it belonged to the city of Sacramento. Faced with a potential quagmire, Park Realty surrendered the block, now known as Grant Park. They also convinced the Northern Electric Railway, who built a freight railroad on C Street in 1907, to add local streetcar service, turning another potential liability into a neighborhood amenity. Meanwhile, the new fairgrounds were built on Stockton Boulevard east of Oak Park. Formally opening in 1909, the new site replaced the old Union Park and the Grand Pavilion. Pacific Gas & Electric extended their Oak Park streetcar line via 4th Avenue, carrying visitors from the Southern Pacific depot to the fairgrounds. Central California Traction carried passengers from downtown Sacramento and the new suburb of Colonial Heights in their own streetcar, and interurban passengers and freight from Stockton. The fairgrounds represented a City Beautiful project of their own, inspired by fairs like the 1893 Columbian Exposition and the 1901 Louisiana Purchase Exposition. The exhibit buildings were designed in a mixture of Classical forms and Spanish Revival styles, with clay tile roofs and stucco walls, to reflect California’s heritage while promoting City Beautiful ideals. 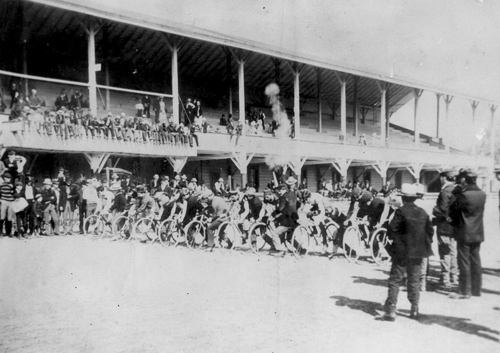 A racetrack and stockyards were an integral part of the fairgrounds. Fairs continued there until 1968, when Sacramento’s continued expansion prompted the move to the current Cal Expo property. A handful of the Stockton Boulevard fair buildings survive, but there is no trace of the first permanent home of the California state fair – in Midtown. What buildings survive from the Stockton Blvd. fairgrounds? I think there are three. One is on Stockton Boulevard across from the DMV building, a large brick building with a rounded “nave” visible from Broadway. The second is on Stockton Boulevard, another brick building with a tile roof, but newer than the one on Stockton Boulevard. I’m not sure exactly where “Governor’s Hall” was, but it was a popular concert venue in the late 1960s about the same time the fair was relocating to its new site at Cal Expo, and was a preferred spot for the Grateful Dead when they came to town. The third is the water tower on the north end of the old fairgrounds near 48th and V.